Reports in the literature on clinical outcomes are highly variable. The lack of objective, prospective, controlled data makes it impossible to directly compare the 2 treatment options with regard to pain relief, patient satisfaction, gait, and function. Ankle arthrodesis is known to cause an altered gait. Studies find that although highly satisfied, patients who undergo ankle arthrodesis continue to have functional limitations after surgery, including difficulty walking on uneven ground, difficulty with stairs, and aches after prolonged activity. Brodsky et al  included 50 patients who had undergone TAR with the Scandinavian Total Ankle Replacement (STAR) in their prospective study. They found increases in walking velocity (cadence and stride), range of motion (approximately 3°), and ankle power in patients who received the STAR implant. Hahn et al  compared gait after ankle arthrodesis and TAR in 18 patients. After 12 months of follow-up, the authors found that pain had decreased and gait velocity and stride length had improved with both treatment options. In addition, range of motion improved in TAR patients, and peak plantar flexion moment increased in ankle arthrodesis patients. Sinber et al  compared outcomes of ankle arthrodesis and TAR with normal controls. Patients who underwent TAR had greater motion in the sagittal plane. Patients in both treatment groups had decreased plantar flexion, ankle moment, and ankle power. The 2 groups also had similar improvements in patient-reported outcomes. Neither treatment group had a return to a normal gait. Dr. Ryssman concluded that patients who undergo either procedure will see improvements, but they will not regain normal motion or gait. Several studies suggest that adjacent joint arthritis increases after ankle arthrodesis. This is believed to be due to altered biomechanics and increased motion and wear through the subtalar and tarsal joints as compensation for the loss of ankle motion. A meta-analysis by Ling et al  found altered biomechanics and an 18% to 100% prevalence of adjacent joint arthritis in studies of patients who had undergone ankle arthrodesis. Their analysis, however, was unable to show that ankle arthrodesis was the cause of the adjacent joint arthritis. Postoperative radiographic findings of arthritis did not conclusively correlate with clinical outcomes. For ankle arthrodesis, the complication rate ranges from 6% to 60%, with the non-union rate ranging from 0% to 41%. For TAR, the overall complication rate ranges from 10% to more than 50%. The union rate for ankle arthrodesis is around 90%. An advantage of this procedure is that once the arthrodesis heals, it will never fail. A meta-analysis of 49 studies by Haddad et al  examined outcomes of TAR and found a 5-year survival rate of 78% and a 10-year survival rate of 77%. A similar study by Zaidi et al  looked at 58 studies and found a 10-year survival rate of 89%. Dr. Ryssman tells his patients to expect a 10- to 15-year survival rate of about 80%. 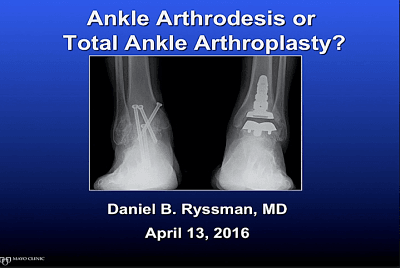 Dr. Ryssman said reliable correction of the ankle deformity can usually be achieved with an ankle arthrodesis. It was historically thought that a coronal plane deformity of greater than 10° was a contraindication to TAR. This degree of deformity was believed to cause increased talar tilt and edge loading, leading to accelerated polyethylene wear, component loosening, and early failure. More recently, surgeons performing TAR have been able to correct preoperative deformities of up to 20° and achieve good outcomes. One study,  however, found no significant differences in severity of coronal plane deformity and clinical outcomes in TAR at 2 years after the procedure. Dr. Ryssman said deformities must be corrected if the surgeon is performing TAR. Multiple studies have shown that obesity is associated with increased rates of complications after ankle arthrodesis and TAR, and obese TAR patients have increased long-term risk of implant failure. When comparing ankle arthrodesis and TAR, Dr. Ryssman finds that some indications are “hard and fast” and some are relative. So when discussing the options, Dr. Ryssman counsels his patients about the pros and cons of each procedure and together they make a decision based on patient factors such as history, health, expectations and desired activities. Click the image above to watch Dr. Ryssman’s presentation.